The patrol boat Project 03160 Raptor has been floated out at the Pella shipbuilding plant in St. Petersburg. After the sea trials, the vessel will join the Baltic Fleet. 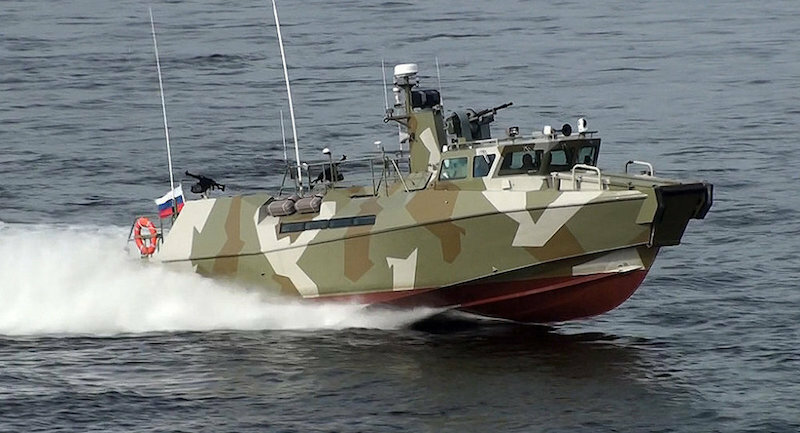 The patrol boat Project 03160 is built at the Pella Plant in the interests of the Navy to patrol assigned maritime zones. She is high-maneuverable and equipped with efficient armament. CHENNAI, India --- Larsen & Toubro (L&T), Indian multinational engineering conglomerate and Nexter (NS), defense major from France, are showcasing their capabilities in artillery systems at the Defexpo 2018, India’s premier land, naval & internal homeland security systems exhibition at Chennai. The Companies’ product range can be seen at L&T’s booth 8.1.5 B and Nexter’s booth 3.2.2B. Since 2011, the L&T-Nexter consortium has been working to provide an effective solution to Indian army’s needs and is building the partnership around one of the main Indian artillery programs, the Towed Gun System (TGS). The Consortium-developed TRAJAN, with its 155mm, 52-caliber cannon, was evaluated by the Indian Army, which conducted extensive firing and mobility trials in rigorous climatic conditions and on several types of terrains. It is noteworthy, that the TRAJAN deploys the combat-proven artillery ordnance used by the French Army and other armed forces in the world. In line with the ‘Make in India’ vision, 40 per cent of TRAJAN Towed Gun system was produced in India as of the prototype stage. TRAJAN offers enhanced firepower through quicker response, longer range and improved accuracy. It covers larger areas with fewer guns and enables maneuverability and quick reaction time while ensuring safety. « Make in India» product. In addition, this solution has continuity with TGS since MGS shares the same gun as TGS”. Larsen & Toubro is an Indian multinational engaged in technology, engineering, construction, manufacturing and financial services with over USD 17 billion in revenue. It operates in over 30 countries worldwide. A strong, customer–focused approach and the constant quest for top-class quality have enabled L&T to attain and sustain leadership in its major lines of business for over seven decades. Nexter, the leading French land defense company and third European player in the ammunition sector, is part of the KNDS Group. Nexter's 2016 turnover amounted to €866 million, of which 19% is allocated to Research and Development activities.